SAN FRANCISCO, CA--(Marketwire - October 26, 2009) - On November 17, 2009, the Nob Hill Masonic Center will open its doors to thousands of cleantech industry professionals for the Third Annual Cleantech Open Grand Expo & Awards Gala. The event will commence with an exposition floor filled with over 120 cleantech companies, followed by a series of demonstrations and business plan pitches from Cleantech Open finalists. The afternoon will continue with the national awards ceremony, during which the 2009 National Cleantech Open winner will be announced and presented with a $250,000 prize package. Afterward, a private champagne reception will provide an opportunity for attendees to mingle, network and explore business development opportunities alongside speakers and Cleantech Open winners. Competition categories include 'air, water and waste,' 'energy efficiency,' 'green building,' 'renewable energy,' 'smart power, green grid and energy storage' and 'transportation.' Audience members will be invited to participate by voting for the "Peoples' Choice Award" of their favorite companies and technologies. The event, which marks the grand finale to the Cleantech Open's year-long business competition, is designed to showcase the boldest clean technology ideas, the most ambitious entrepreneurs and the brightest investors, venture capitalists and prospective technology customers. The Cleantech Open is made possible by the generous support provided by National Expansion Sponsor: U.S. Department of Energy's Office of Energy Efficiency and Renewable Energy; Platinum Sponsor: PG&E; Gold Sponsors: Autodesk, The Cleantech Circle, Google, Southern California Edison, San Diego Gas and Electric, Wilson Sonsini Goodrich and Rosati; Silver Sponsors: Accretive Solutions and RoseRyan; and Program Sponsors: California Clean Energy Fund, Ernst and Young, and Korn/Ferry International. All Cleantech Open Green Card Holders receive free admission including Premier seating at the Awards Gala, as well as unlimited access to all the public Cleantech Open events. To sign up for a green card, visit http://www.cleantechopen.com/app.cgi/green_cards/signup. For more information or for general registration, visit http://www.cleantechopen.com. Journalists are encouraged to visit the Cleantech Open Media Portal for news and updates: http://www.cleantechopenmedia.com. The Cleantech Open is the world's largest cleantech business competition. It finds, funds, and fosters entrepreneurs with revolutionary ideas, technologies, and products that address today's most urgent energy, climate, and economic challenges. Through its one-of-a-kind business competition and mentorship program, the Cleantech Open has helped hundreds of clean technology startups bring their breakthrough ideas to fruition. Since 2006, the Cleantech Open has helped alumni contestants raise over $125m and made thousands of green collar jobs possible. In addition to the original competition held in California, the 2009 Cleantech Open was expanded to include two new regions: the Rocky Mountain region, including Colorado, Montana, New Mexico, Utah and Wyoming; and the Pacific Northwest, including Washington, Oregon and Idaho. Cleantech entrepreneurs compete for a total of more than $1 million in prizes. Fueled by a network of over 400 volunteers and sponsors, the Cleantech Open unites the public and private sectors in a shared vision for making America's cleantech sector a thriving economic engine. Past alumni successes include Adura Technologies, Cool Earth Solar, Enverity, Federspiel Controls, GreenVolts, GroundSource GeoThermal, Lucid Design Group, Mission Motors, and Syncromatics. 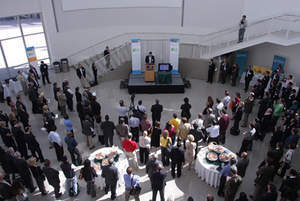 For more information, visit www.cleantechopen.com and follow @cleantechopen on Twitter. Cleantech Open 2008 attendees take in a presentation.